Yes, so is Wydad Casablanca. The game happened as expected, an encounter between two teams trying to keep the reputation that is theirs on the continental level, to maintain and consolidate dominance over African football. 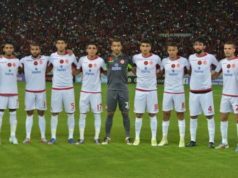 But to Wydad, victory meant a lot more: keep alive the current renaissance of Moroccan football; win the club’s first ever African Super Cup; put a definite end to the counter-performances that have been ailing the squad in the national league. Benzarti had told his boys that winning Saturday’s game would usher them in the club’s history! The Reds would forever remember them. This was not a mere game; it was a call of duty. You give your utmost and claim the pride of those who give you unconditional love. A goalless first half full of thrilling moments; an engaging, tense, and offensive-filled performances from both teams. It truly was an encounter of titans! To win, for both sides, meant the whole world. Wydad controlled much of the game. 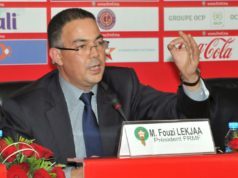 Cheered and hailed by fans thirsty for a first African Super Cup to decorate the team’s already legendary trophy collection, their mood boosted by the assurance that comes with playing at home, Wydad’s boys played their all to get the ball pass through that seemingly impenetrable Congolese citadel. But to no avail, at least until the 82nd minute. Then came that free kick. 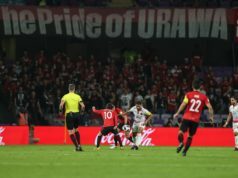 When Amin Tighazoui put the ball on the ground, the 28-year-old did not look at the Red Sea that had invaded Mohamed V Stadium. 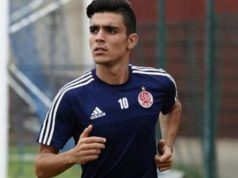 But he knew that all eyes well set on him, that prayers were being said, that scoring would mean entering Wydad’s history through a golden gate. And so he did! In a breathtakingly remarkable moment of Messi-esque inspiration, the Moroccan winger got the ball pass through the wall and lodge itself in the Congolese goal, to the delight and utter pleasure of the thousands of red-clothed fans at the Mohamed V complex. Wydad did not only win on Saturday. It made history. And add Wydad’s Saturday victory to the national CHAN triumph weeks ago, you’ll see that Moroccan football is clearly enjoying its best moments in recent years. And so the footballing renaissance lingers on!